onstruction of the weighbridge at Witu, along Garssen -Lamu highway, is 60 percent complete, principle revenue officer Ahmed Ali Omar has said. 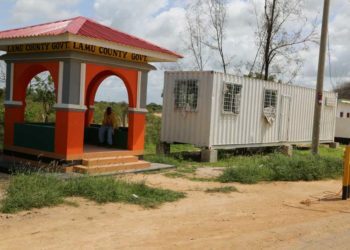 Witu town where the weighbridge is been put up serve as an entry point to the Lamu county and it will be the first one to be built since independence. This came at a time when the construction of The Lamu Port-South Sudan-Ethiopia –Transport corridor is underway which sees the number of a truck using Garssen-Lamu road increased. According to Mr. Ahmed, all the trucks coming to Lamu will have to go through the weighbridge to ensure they comply with the regulation. Also, the county has put in place two revenue collection barriers with the container in Ndeu and near Mokowe Jett. Ndeu revenue barrier is collecting fees targeting truck carrying building materials from quarries and truck coming from the port side. Mokowe revenue barrier is targeting raw materials from fish product especially from Lamu east constituency and building materials from Manda and Maweni in Shella ward. Also, Mokowe revenue barrier is collecting parking fees from small vehicles at 100 Kenya shillings, a mini trailer at 200 and heavy trailers at 300 fees. All vehicles which are coming from outside the Lamu County are paying ksh 50 as entry fees and all PSV vehicles paying monthly sticker for 1000. Many motorcycle operators have not registered with Sacco make it hard to truck them. Lamu county assembly is yet to pass the bill on regulation of revenue collection making it difficult to enforce the law. Basuba ward has no revenue collection station because of the logistic and insecurity.